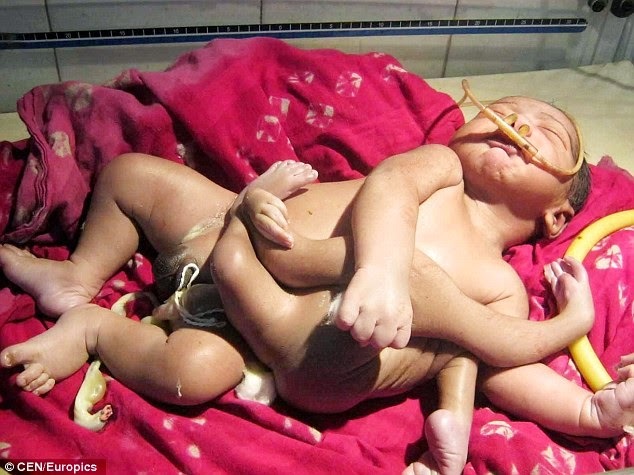 A baby boy born with four arms and four legs is causing panic in the streets of Baruipur, east India, as locals believe he is the reincarnation of a god. ‘When he first came out we couldn’t believe it, the nurses said he was badly deformed but I could see that this was a sign from God. In fact, this is a miracle, its God’s baby. Indian God’s have extra limbs just like this,’ a relative said. Yes, I heard about this, at least poor boy didn’t get murdered. I wonder how long this tradition would last though given advances in technology. Today surgery of this sorts is safer than it used to be especially if the limbs can be removed without any danger to the life.